The feed belt has been modified to have a wider surface track. A double row of idle pressure wheels allows for excepional grip, eliminating lateral movement of the board on the track. This adds to the precision application of the edging to the board. A stopper has also been introduced at the infeed point, which activates while the machine is in process of edging. The stopper will only deactivate once the previous cycle is completed. This eliminates the incorrect in-feed of the panel, thus preventing damage to the panel or your machine. A heated infeed fence has been introduced as a standard, to increase adhesion properties. The control panel has been ergonomically designed to ease operation and operator interface. Intercession by PLC control is facilitated to prevent start up of the feed system prior to the optimal operating temperature of the glue being confirmed by the pre setting on the thermal control. The glue pot temperature preset is adjustable to suit the specification of your glue supplier, to avoid over heating, and subsequent destruction of the performance of the glue adhesion. All functions of operation are independantly switched, to allow your operator to intervene in the case of any emergency. The glue pot capacity has been decreased to reduce the degrading of the glue efficiency. The pressure rollers are pneumatically controlled to optimise pressure applied between 0.4 mm and 3 mm. The front and back trimmers are controlled for precision trimming. Timer intervention is electrically and pneumatically adjustable. The top and bottom trimmers are controlled via mechanical discs to follow the board thickness. Lateral adjustment of the trimmers is indicated via digital dial for accurate adjustment between 0.4 mm to 3 mm. The scraping unit has pneumatic activation on top and bottom scrapers, with micrometric adjustment for precision scraping. The buffing unit has pneumatic activation, and can be excluded when not needed. It can also be electrically excluded on the control panel when the function is not required. 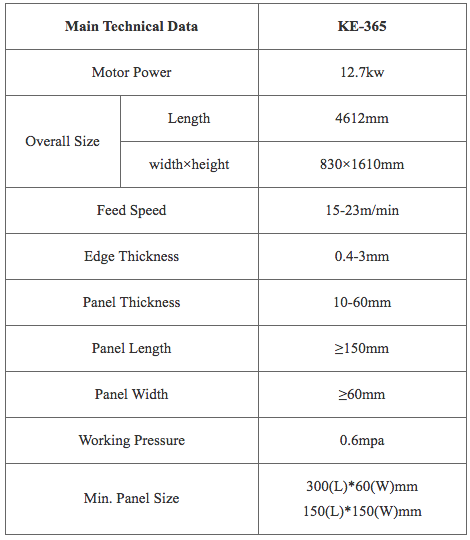 T-EB 130 Non-linear Edgebanding Machine is the right and most economic solution for working with edging materials (PVC, ABS) between 0,4 and 3mm thickness. Used for trimming of edges up to 2-3 mm in thickness and 50 mm height with double motor after manual edge banders. Trimming head can move up and down and also very easy to make adjustment on it. T-FE 140 is a very suitable machine to work together with T-EB 130 or T-EB 170. T-EB 149 is a compact machine offered as a small economical series machine that is equipped with the units of professional (advanced) machines. and provides an optimum cost to performance ratio. For being small sized and having end cutting and top & Botoom trimming units besides standard units, proves to be an entry level but heavy duty automatic edge banding machine manufactured in conformity with European safety norms like all Turanlar machine range. 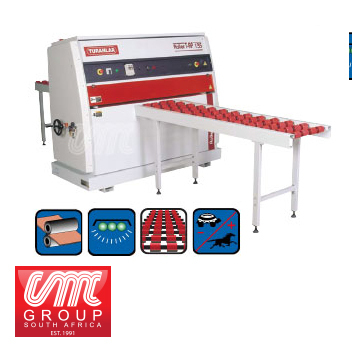 T-EB 151 is a economical series TURANLAR edge banding machine. Perfect cleaning – zero tolerance – of front & rear sides of the panel by end cutting unit with two angled saws and two high frequency motors , top bottom trimming and finish by scraping – buffing units are offered in single machine. Veneer, Solid wood etc.) Its touch screen PLC control panel ensures very easy operation. It achieves to band 50mm wide panels. T-EB 153 is a professional series machine with modern functional design. It has a maximum feeding speed of 20m/min. T-EB 153 perfectly performs with PLC touch screen, gluing, end cutting, top-bottom trimming, radius scraping and buffing processes. It can apply all common edge materials having thickness between 0,4 and 3mm. (PVC, ABS, Melamine, Veneer, Solid wood etc.) Its touch screen PLC control panel ensures very easy operation. It achieves to band 50mm wide panels. Ease of use of control panel due to its movable construction. Single side Edge Banding Machine. 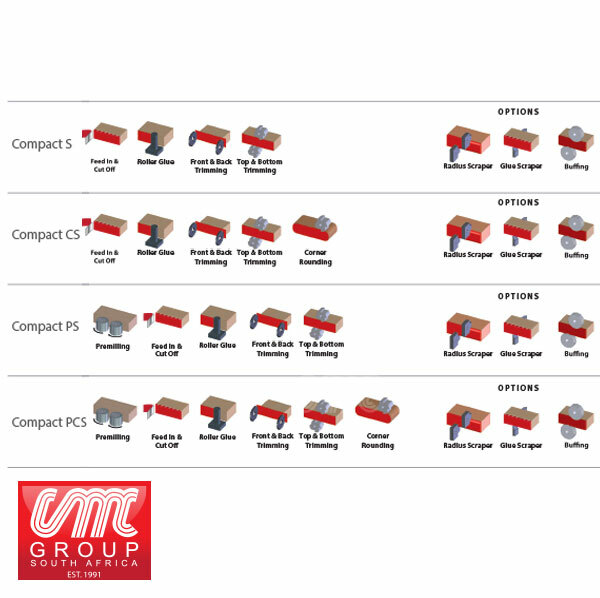 Apart from the standard units for banding (standard units: auto pulling, band table, glue pot, pneumatic cutting units, pressure group) equipped with pre-milling unit, top trimming, bottom trimming, top bottom scraping, and top-bottom buffing. The brand new edge banding machine model designed to fulfill the needs of companies willing a high quality finish on edge banding whilst having very affordable costs.In addition to the basic units that our very popular model T-EB 157 has, it also offers anti-adhesive liquid, hot air blower and grooving saw. Manual Nonlinear Edge Banding Machine. It is equipped with glue units, guillotine and pressure unit. It is used to adhere the PVC and ABS, to sheets having contour and straight edges. T-EB 601 edgebanding machine provides complete solution for edgebanding processes. Its perfect design and comprehensive units contribute to meet all requirements of both large and small companies at an affordable price. Modern functional design and strong machine structure maintain the machine’s trouble-free operation and offers also operating convenience by PLC based control in addition to improved safety conditions for users. T-EB 601 perfectly performs premilling, gluing, end cutting, topbottom trimming, top-bottom contour trimming, grooving, radius scraping and buffing processes. High frequency motors, electrical components, pneumatic system and some other parts inside the machine supplied from most reputable European producers and that guarantees perfect production quality and long service life. 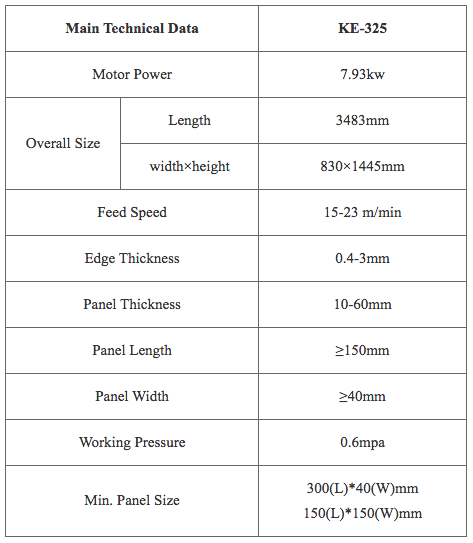 T-EB 601 operate at speed of 12 m / min and can apply all common edge materials (PVC, ABS, Melamine, Veneer, Solid wood etc.) 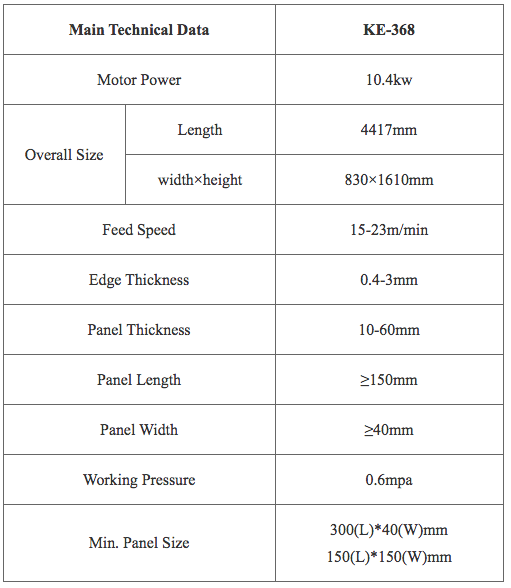 to all types of panels up to 3mm thickness with high precision. Fast, reliable and highly productive edge banding machine (The highest Model in Edge banding machines) with outstanding features. Belt conveyor system, Diamond knives, adjustable speed up to 25 m/min. , automatic glue feeding, and remote connection through internet are some of these features that make T-EB 701 a very good investment. Ease of use of the Control panel due to its movable construction. Stores up to 40 different programs. 3 steps of feeding speed 15- 20 – 25m/ min. Thermo inverter used for protection of high frequency and other motors. Automatic height adjustment according to the panel thickness. Fully adjustable grooving saw unit. Milling Machine T-FC 198 opens profiles on the edges of MDF, Chipboard etc. panels in order to make them ready prior to postforming and softforming applications. The machine consists of conveyer unit, 2 pieces profiling cutter heads, groooving saw and speed adjustment feature. T-PF 190 is an affordable, entry level, basic Postforming Machine, especially very suitable for small enterprises and workshops. It has single profile cartridge, bottom laminate excess trimming unit and resistant heating elements. T-PF 590 , as being the highest model of Turanlar postforming machines, provides a complete solution in postforming applications.With its reasonable price and high productivity, T-PF 590 is an ideal option to companies for those postforming is a common task in panel furniture production. 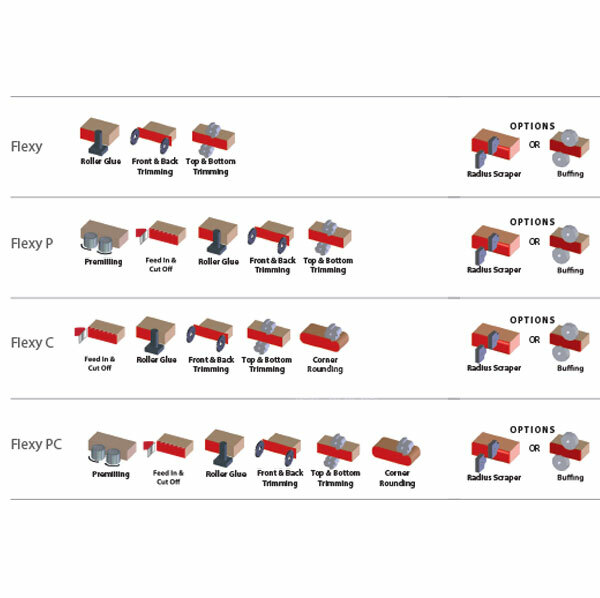 T-PF 590 postforming machine guarantees precise,efficient and productive operation. provide sudden heating up to the required temperature. It is used cover laminates on the materials such as chipboard, MDF, plywood, guarantees perfect adhering on the bright and thin materials thanks to its pneumatic press and hard rubber rollers. No waiting period. No limit to the work piece length, and easy to use. The energy consumed by the machine is less than that of normal presses. The area covered by the machine is very small even with using in-feed and out-feed transport tables. It is appropriate for mass production for it is throughfeed. T-PF 161 Postforming Machine is a functional, and productive machine and equipped with top-bottom infrared mediumwave heating lamps, triple profile cartridge, laminate excess trimming unit, grooving saw and buffing units to ensure best quality finish on postformed products. KE 3 series edge banders provide the best value in the industry. As affordable work horses, they can be found in a large number of panel furniture manufactures around the world. 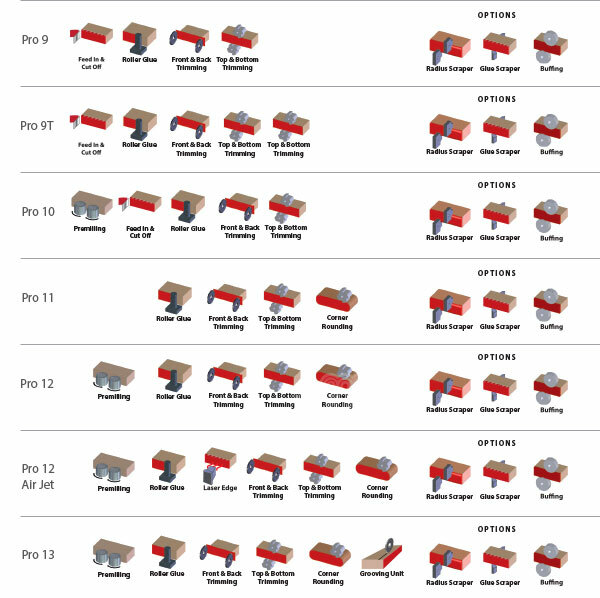 The 3xx series has basic functional units such as gluing, pressure, end cutting, trimming, scraping and buffing. A long list of options are available such as pre-milling, rough trimming, flat scraping and hogging.